In recent years many people in Milingimbi have asked about the plane wrecks and how they got here. Most people knew that they were a result of the war with the Japanese, but that was all that was known. I was determined to find out and record the facts, and the ADF military archives had all of the answers. While researching Milingimbi, I knew it was necessary to include the local Aboriginal Yolngu people, and the missionaries’ records were also a great help. Yolngu labourers worked on the runways and, with their knowledge of the lands and seas around Milingimbi, were a great asset to the military forces stationed on the island. I have had Yolngu help in researching the past about men such as Bunuyura, the traditional landowner, and Makarrwala, a great leader of his people and who gave assistance to the military forces while they were here. Yolngu knew the Japanese well, as they were in Milingimbi waters collecting pearl shell prior to the war. 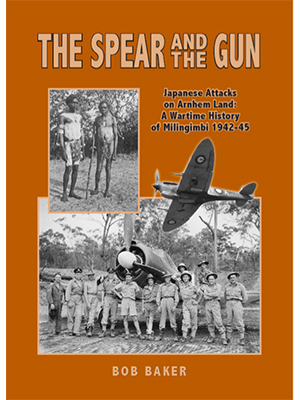 When war broke out, Yolngu were informed of the atrocities and killings being carried out by the Japanese and then the air attacks on Milingimbi began. Milingimbi had fighter aircraft to defend it and Army troops on the ground. The island became a refuelling base for RAAF bombers as they refuelled and attacked the Japanese who had become entrenched in the islands north of Australia. Many bombers needed to return to refuel at Milingimbi before returning to their air bases outside Darwin. This book records the airmen and Yolngu caught up in the battles against the Japanese and those Aboriginals who rescued our airmen during the war. Also included are other Australian air bases, as the threat of invasion was so real at that time right across northern Australia.